A bet that has now collected in a staggering 17 of Tottenhamâ€™s last 19 matches is worth following again at a highly generous looking odds-against. All three of this seasonâ€™s clashes have featured at least three goals and with Spurs still scoring and conceding for fun that is unlikely to change here. Arsenal have finally remembered how to score and Spurs have kept only one clean sheet in their last 13 games. 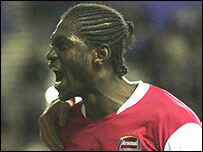 Adebayor hasnâ€™t bagged one for nine games now and is due one. He likes it against Spursâ€™ leaky backline too (conceded the first goal in last three) as he has scored the opener in two of their last three clashes. Wednesday are now unbeaten in 10 (four straight wins) and making a late challenge for the play-offs. Coventry were hopeless against Preston (lost 4-0) and their mini-revival under Iain Dowie appears to be over (after five game unbeaten they have lost three from four). The weekend banker. The two late goals Charlton conceded against Everton came after four consecutive clean sheets and though their revival has been over hyped, Alan Pardewâ€™s men should be a goal too good for Sheffield United (lost last eight away). It may even be worth having a couple of quid on Darren Bent and 1-0 at around 20-1. Burnley are at home and have had an upturn in form recently (four wins in five) while West Brom, despite having one of the best teams in the Championship, have lost the plot in recent weeks (five defeats in eight). A value bet for a Monday night. Last week’s bets: Lee correctly predicted that Reading would beat Fulham and that Sunderland would beat QPR 2-1. Good shouts both. Did you have to jinx Sheffield Wednesday like that?! We’re going well and I didn’t think anyone had noticed us creeping up towards the play offs – we’ll lose on Saturday now! yep, play offs still in sight with two easyish home games. plus the small matter or birmingham away next weekend.